Summer. Pool. Good friends. For one L.A. design team, it all adds up to a party. Ron Woodson couldn’t avoid entertaining if he wanted to. His backyard in the Silver Lake neighborhood of Los Angeles, with an alluring tiled pool and lush landscaping, seems to naturally call for a party. No doubt his friends with a social yearning love to get an invite “ping” from Ron on their devices. Ron and Jamie wanted the beaming sun to accessorize, not steal, the show. Their solution? A protective cabana-style tent trimmed in pool blue and tangerine. Underneath, the pair assembled a host of textures that range from chairs with a chunky, sweater-like weave to fabrics with geometric and paint-splotch patterns. 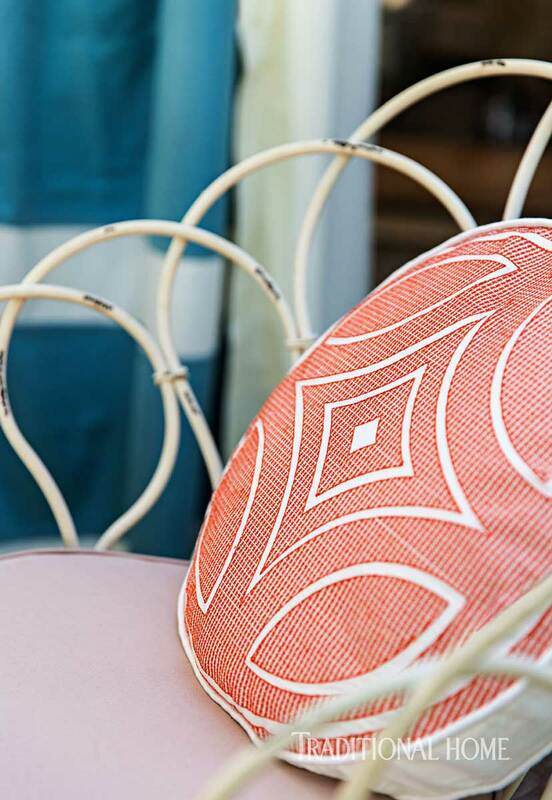 A Boutique Tents cabana shades JANUS et Cie’s “Tosca” armchairs and “Mirthe” table. 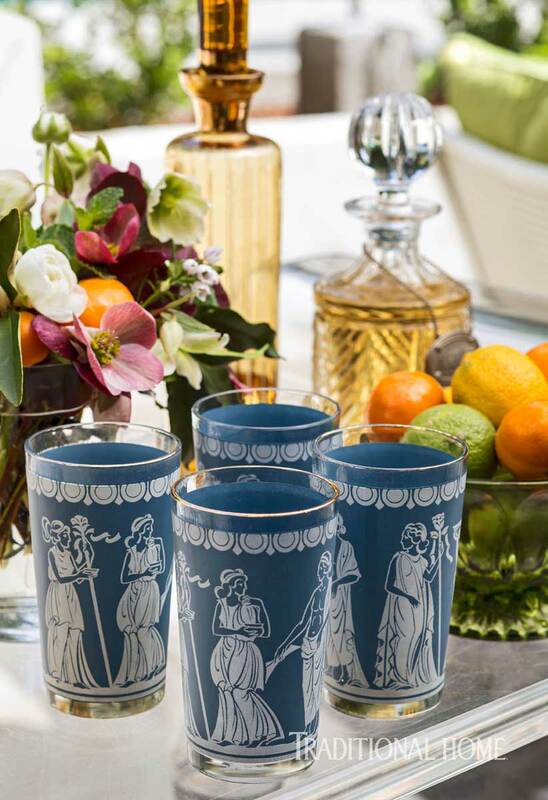 Tumblers from Devine are as colorful as Bloom & Plume flowers and Inner Gardens kumquat trees. The “Commodore” lantern and rug are from Harbinger. Those lucky guests who got the ping toasted with peach fizz cocktails, followed by chilled cucumber soup, grilled salmon with pasta primavera, and melon-basil granité. 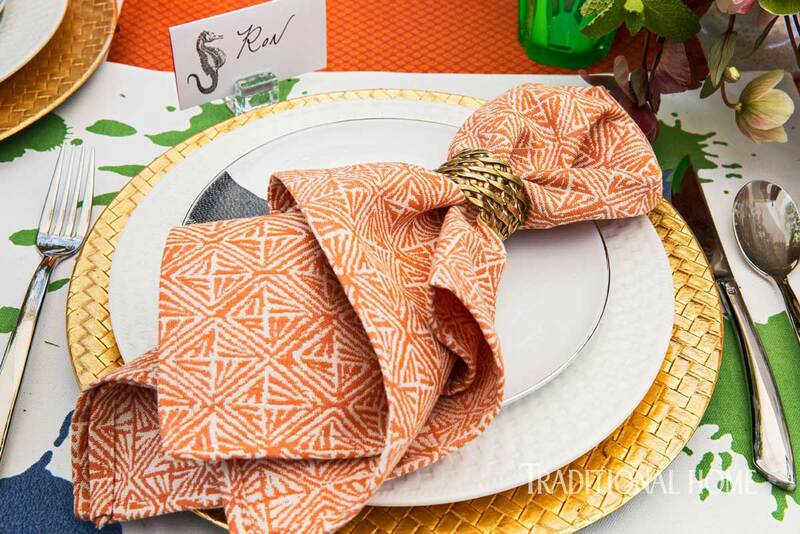 A runner in “Shiboni” fabric, placemats in “Splat,” and napkins in “Basket Case,” all from Perennials, dress the table set with metallic gold chargers and Wedgwood “Nantucket Basket” plates. The blue-and-white glasses are vintage from Ron’s collection. The pillow (and Jamie’s dress) are from Trina Turk. 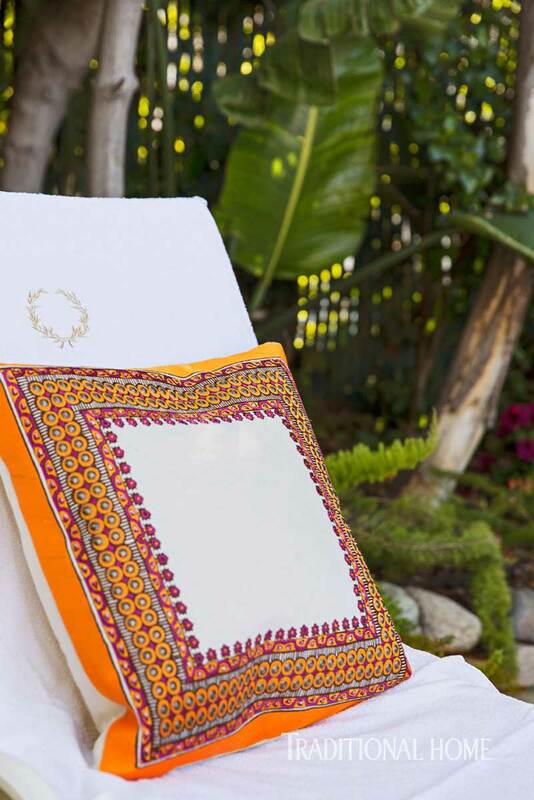 The “Costa Mesa Medallion” pillow is also from Trina Turk. 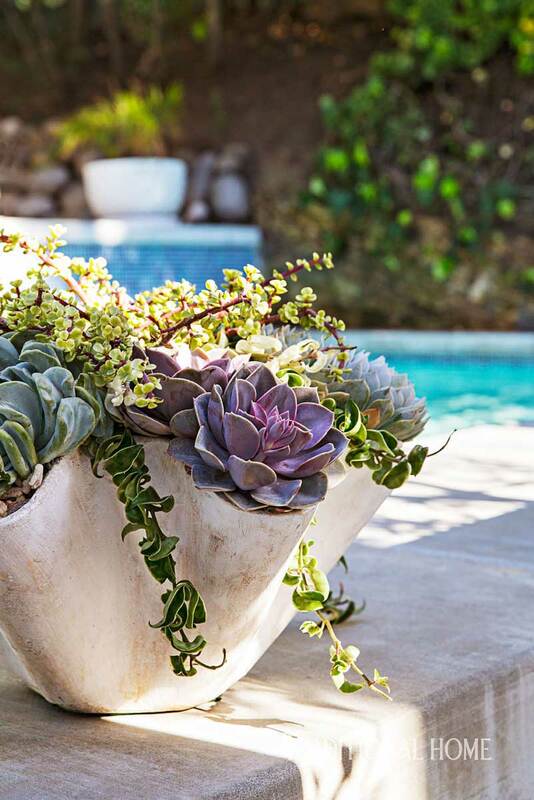 A wavy ceramic container from Inner Gardens holds succulents. 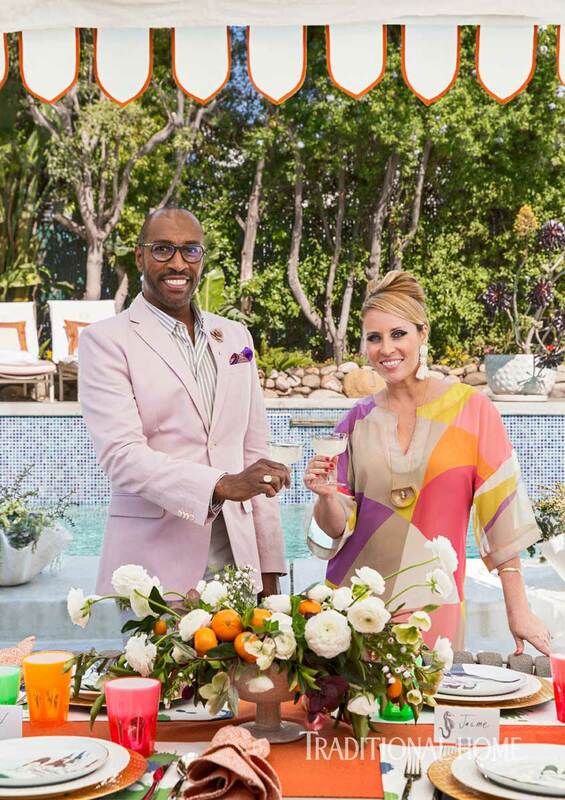 The design team of Ron Woodson and Jamie Rummerfield beat the heat with a delightfully light and refreshing summer luncheon menu. Recipes are by Los Angeles chef Mary Payne Moran. Note: Unless specified, when we call for “butter” we mean the unsalted variety. When we call for “brown sugar,” we are calling for light brown sugar. 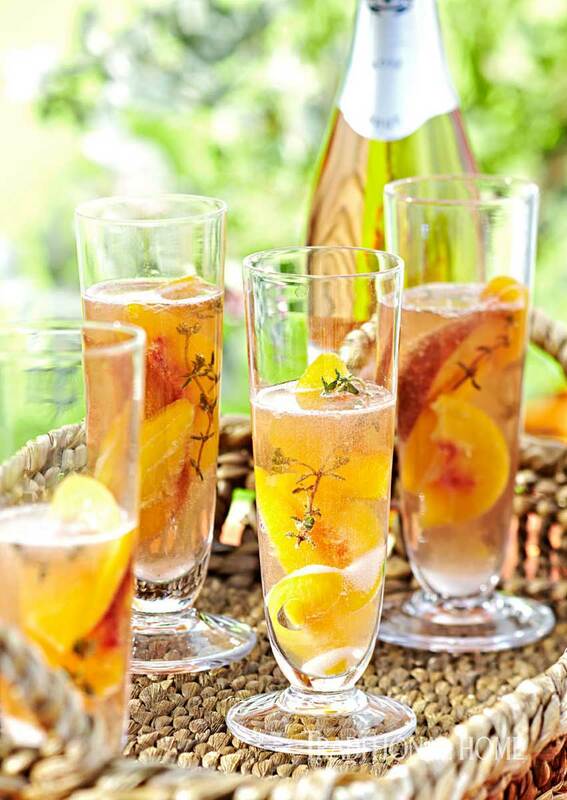 A simple garnish of peaches and thyme changes a glass of prosecco into an elegant summer aperitif. Champagne cocktails with slices of fresh peaches and sprigs of thyme fill blown-glass “Barre” flutes from Simon Pearce. They are set on a handled seagrass tray from Target. Add peach slices to sparkling rosé. Garnish with fresh sprig of thyme. Makes 1 serving. *Tip: Freeze peach slices before using to help keep wine cold. 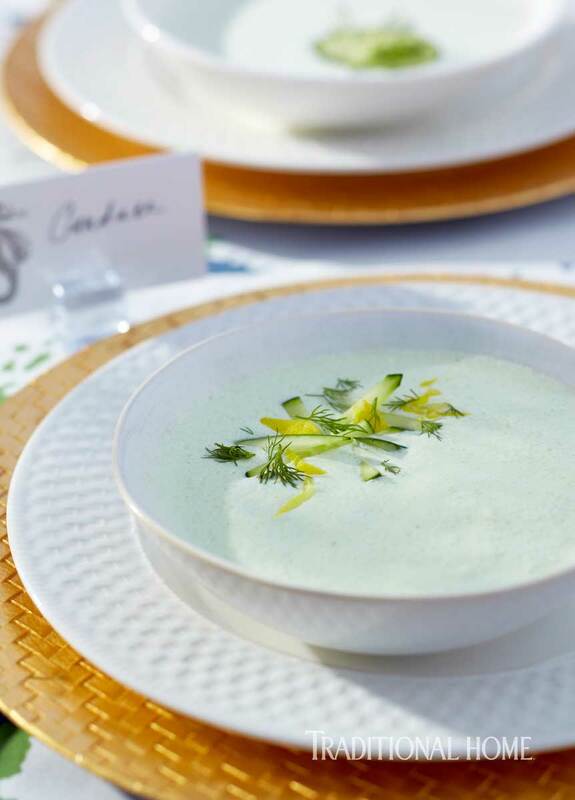 The combination of dill and cashews brings depth to this refreshing, light summer soup. In 2-cup measure, combine cashews and half-and-half. Let stand 20 minutes. Add half of cashew mixture and half of cucumber to blender container. Cover; blend until very smooth. Strain through fine mesh sieve. Add remaining cashew mixture, remaining cucumbers, green onions, sour cream, lemon juice, champagne vinegar, dill weed, parsley, and cumin to blender container; cover, blend until smooth. Strain; combine with first mixture. Discard solids. Season to taste with salt and pepper. Cover; chill 2 hours or until thoroughly chilled. Garnish with fresh dill, julienned pieces of cucumber, and shredded lemon peel, as desired. Makes 6 (3/4-cup) servings. Grilling the vegetables for this primavera gives this classic dish a new twist. Spray vegetables with olive oil spray; season with kosher salt. Preheat grill to medium-high heat. Grill vegetables 3 to 5 minutes on each side or until grill marks are dark and vegetables are just tender. Remove vegetables; transfer to sheet tray. Toss grilled vegetables with lemon juice, champagne vinegar, and 1 to 2 tablespoons of olive oil. Cook pasta according to package directions. Drain; transfer pasta to very large bowl. Immediately toss pasta with 3 tablespoons of olive oil and 2 teaspoons salt. Cool slightly. Add grilled vegetables, parsley, chives, and thyme. Toss gently to combine. Season to taste with additional salt, pepper, and olive oil. Top with shaved Parmigiano Reggiano to taste. Serve with Grilled Salmon and Grilled Ciabatta Bread. Makes 6 (2-cup) servings. Rinse fish; pat dry. Brush both sides of salmon with oil. Season with salt and pepper. Top salmon with parsley, thyme, and lemon zest. Halve fillets by cutting crosswise. 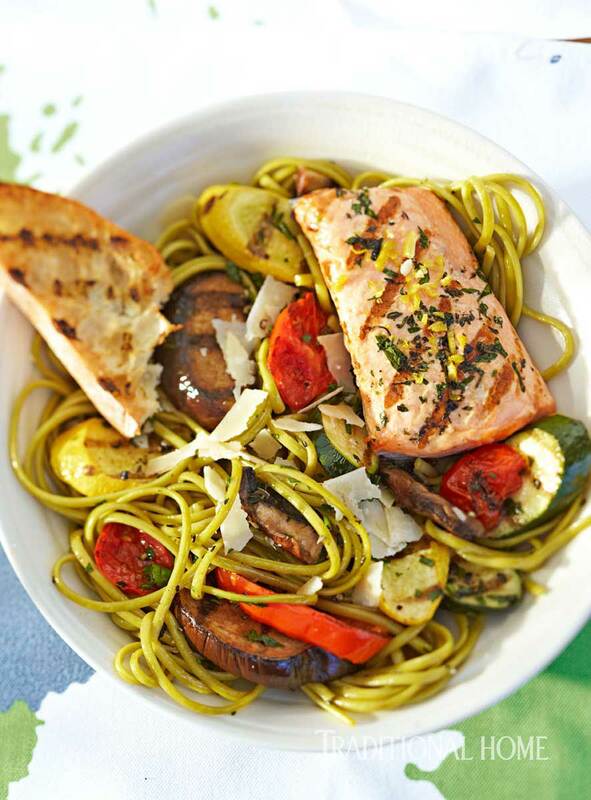 Serve salmon alongside Pasta Primavera with Grilled Ciabatta. Makes 6 servings. Lightly coat bread with olive oil and salt. Heat grill to medium-high heat. Grill bread 2 minutes on each side or until lightly charred and toasted. Makes 6 servings. A granité is basically a shaved ice dessert. It can be made at least two days ahead and kept covered and frozen. Dessert is served in Villeroy & Boch’s “Flow” bowl. In medium saucepan combine water and sugar. Cook and stir on medium heat until sugar has dissolved. 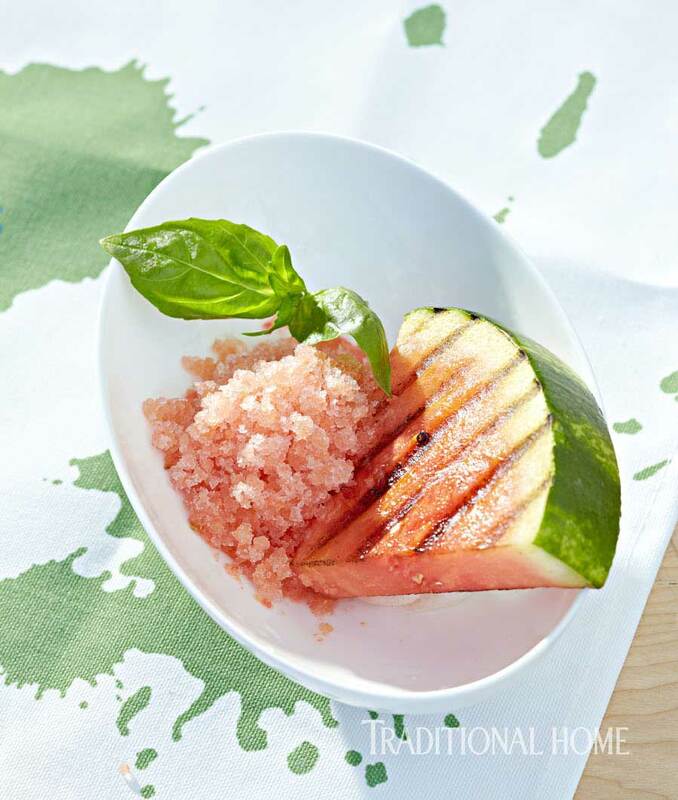 Stir in pureed cantaloupe, watermelon, 1 cup basil leaves, and lemon juice. Let stand 30 minutes. Use slotted spoon to remove and discard basil leaves. Pour liquid into 3-quart rectangular baking dish. Freeze 2-1/2 hours. 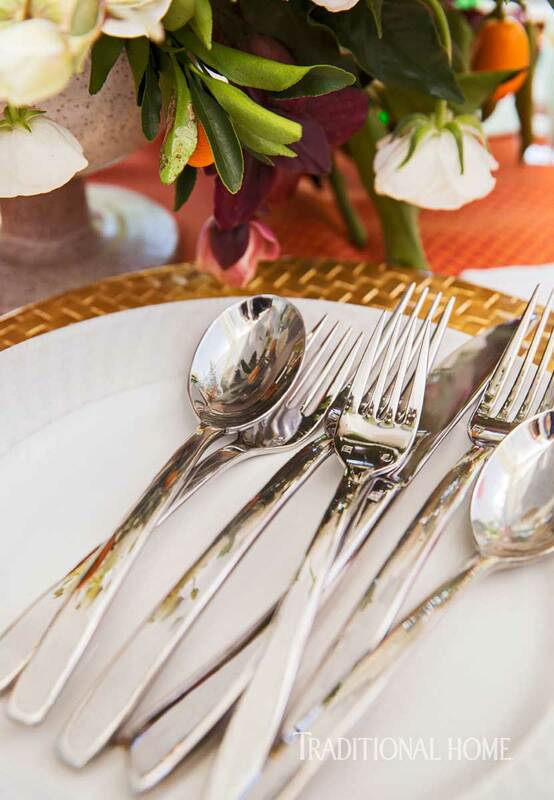 Use the tines of fork to scrape mixture into ice crystals; flatten down ice crystals. Place granité back in freezer another 30 minutes. Repeat process until mixture is light, fluffy, and can be scooped like ice cream, about 2-1/2 hours more. Scoop granité onto each grilled watermelon slice. Garnish with additional small basil leaves. Makes 9 (1-cup) servings. *For Grilled Watermelon, dry each slice of watermelon well. Spray each slice with light nonstick spray. Heat grill to very high heat and sear watermelon quickly on one side. Remove; allow to cool before serving granité on top. 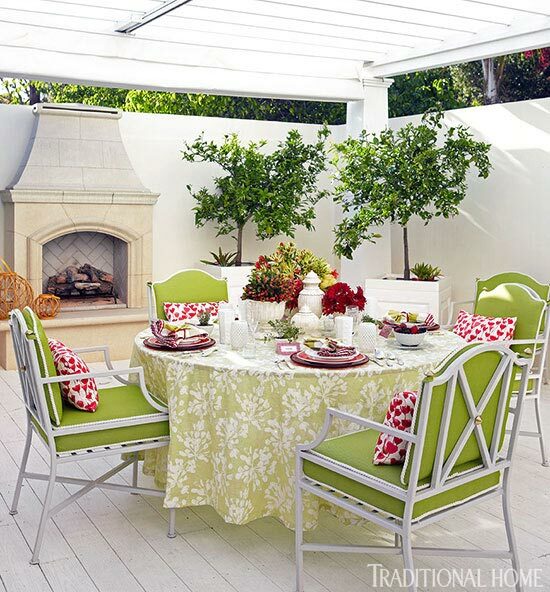 Click here for more fab outdoor entertaining recipes and ideas.